One minute, you’re thinking about how good that Italian sausage you just picked up is going to make your spaghetti dinner taste. The next, a blur of white racing in from the next lane drives any thought of dinner from your mind. You’re in a crash; police car lights are flashing and first-responders want to know if you’re all right. It’s a dizzying experience as your mind inventories everything that happened and absorbs all that’s changed. And as surely as you’ll send your vehicle to the shop to assess the damages, think about what you need to make sure you’re OK. If there are injuries, you’ll want to head to the hospital for medical attention. You’ll immediately want to see your doctor of chiropractic, too, even if you don’t notice obvious symptoms. Ask Jess Caruso, who in a Palmer College of Chiropractic blog discussed the chiropractic care she received to treat the debilitating effects of a crash. She revealed that it was what led to her decision to become a doctor of chiropractic herself. She doesn’t even want to imagine what her life would be like today, she said, if she had continued to rely on prescription drugs for relief. • With the incredible force involved in a crash, your body takes a real jolt. Even a low-speed fender-bender with a speed change of 2.5 miles can apply intense pressure to your spine, neck, and soft tissues. But the adrenaline of the moment might mask the collision’s effects. By waiting to see your doctor of chiropractic, what might have been averted by a simple adjustment could surface days or weeks later as chronic pain. The earlier you address it, the sooner your body can heal itself, naturally without drugs or surgery. 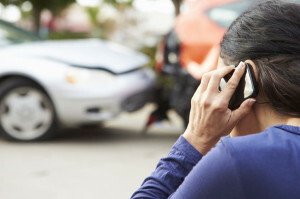 • For insurance purposes, it is important to document your injuries within three days, whether it is discovering a fractured wrist in the emergency room or neck pain caused by soft tissue injuries, most commonly known as whiplash, by your doctor of chiropractic. When you wait a week or longer to seek help, your case loses credibility as your need for chiropractic care increases. • If you experience symptoms such as blurred vision, headaches, dizziness, neck stiffness, or pain in the lower back, shoulders, or arms at any time following a crash, immediately see your doctor of chiropractic. Again, the sooner you receive chiropractic care, the better chance you have of avoiding long-term chronic problems. • The bottom line is that you want to do everything you can to protect your quality of life. Early intervention can decrease the inflammation and scar tissue that threatens your mobility by relieving pain and restoring range of motion. It’s the TLC you give your vehicle without a second thought; why would you think twice about doing the same for this complex mechanism we call the human body? Founded in November 2003 by Kent S. Greenawalt, CEO, Foot Levelers Inc., the not-for-profit Foundation for Chiropractic Progress (F4CP) educates the public about chiropractic care through positive press. The F4CP Executive Board is comprised of chiropractic leaders, stakeholders and others.